1 Year from the billing date against manufacturing defect only. 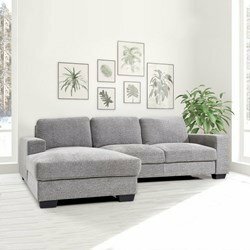 FULLY UPHOLSTERED FABRIC SOFA WITH KILN DRIED HARDWOOD AND PLYWOOD FRAME.ROBUST AND STURDY DESIGN, STRAIGHT LINE FINISH. SOFT FEEL HIGH QUALITY POLY COTTON FABRIC USED. S-SPRING (3.8 MM DIA) AND POCKET SPRING (2 MM DIA) WITH 28 DENSITY FOAM IN SEAT TO GIVE EXTRA COMFORT & BOUNCE WHILE SEATED. WEBBING BELT & POLYFILL IN BACK PROVIDES FEATHER LIGHT SOFT SUPPORT ON SHOULDERS AND BACK. SIDES OF ARMS HAVE THICK PLYWOOD WITH 26 DENSITY FOAM & POLYFILL FOR EXTRA SUPPORT & COMFORT. HARD PLASTIC BLACK RECTANGLE TAPERED LEGS.